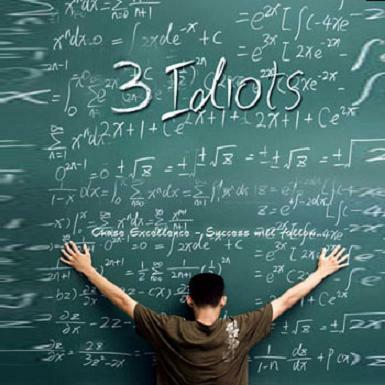 My hindi is not so good..actually very bad..then why did i watch 3 idiots?? its all because of Chetan Bhagat. I’m a big fan of his five point someone and when i heard this movie was inspired from tat, i made up my mind to watch it..a movie made of a book generally is close to crap..except for the lord of the rings series n other few..but this movie never disappointed and was better than the story in a few places..but with a hell lotta changes..everything was perfect from the opening till the end..i thought how ll it be to see aamir as a college student..but then being a perfectionist, he found the answer..cast everyone who looked older than him.. 😉 even kareena..(she looks a lot older than aamir) his introduction scene was hilarious and he held tat charisma till the end..apart from the 3 idiots, the character ‘silencer’ deserves a special mention..he was great..the whole movie was a laughter riot.. u cant stop laughin..tat too the teacher’s day scene and the scene in climax where two of em throw the keys at the same time..i cant spill out the suspense.. 😉 the way they showed raju s family as in a black and white movie added up to the already good camera work..give me some sunshine song was awesome.. ( i didn understand the other songs 😉 still music was good) overall a great movie..worth the watch..they say the one who laughs last didn understand the joke..tat happened to me a few times..still i laughed my *** off..shows how good the movie is..to say in a single line, ALL IZZ WELL.. Previous Previous post: do the new! Next Next post: VAAADAAA!!! theatre ku ullaya veliyaya?? Its not ALL IZZ WELL… its AAL IZZ WELL… Well ur blog left out the details .. would excuse u since u dont know hindi… few words changed to make a hell a lot of difference in that teachers day speech..
yeah, i understood tat wit help from frens man..i just didn wanna let the things out..spoils the fun..
AAL IZZ WELL……..!!!!!! It’s really workin:),Aamir has done a g8 job,tht too de scene whr raju n farhan get their offer letter n payin thanks to “Wangdo!”… tears jus rolled out…..!! !